(VEN) - Secretary of State of the Hungarian Ministry of Foreign Affairs and Trade István Mikola speaking at the sixth session of Vietnam-Hungary Joint Commission on Economic Cooperation in Hanoi said that Vietnam remains Hungary’s key market in Southeast Asia. He also said that the Hungarian government continued to encourage and create favorable conditions for companies to promote trade and investment activities in the Southeast Asian market. Trade turnover between the two countries has experienced significant growth in recent years with an average increase of 10 percent per year. According to statistics, Hungary’s exports to Vietnam in 2014 increased by 42 percent compared to 2013. By the end of the third quarter of last year, Hungary had 13 investment projects in Vietnam with total capital of nearly US$51 million, ranking 53rd among the 101 countries and territories investing in Vietnam in the manufacturing and processing industry, science and technology, transport and warehousing. These investment projects have been implemented in five provinces and cities with the largest being a US$40-million project in the manufacturing and processing industry in Binh Duong Province. However these figures have failed to meet the potential and advantages of the two countries. István Mikola said that to increase two-way trade turnover, Hungary would deploy trade promotion activities and seek cooperative opportunities to implement technology transfers with Vietnamese businesses in information technology, medical equipment, beverages, environmental protection and water treatment. 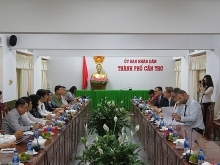 At the sixth session of Vietnam-Hungary Joint Commission on Economic Cooperation, the two sides agreed various measures to promote economic relations, including creating favorable conditions in terms of mechanisms and policies for the two business communities and promoting information exchanges. Strengthened cultural and educational cooperation was also discussed. To date, Vietnam has about 5,000 people studying in Hungary and they will act as a good bridge to promote cultural exchanges between the two countries, paving the way for trade cooperation and development. The signing of the Vietnam-EU Free Trade Agreement (EVFTA) in the coming time will also provide cooperation opportunities for the two business communities. However, in addition to benefits, Vietnam will face many challenges as the number of business rivals will also increase. Therefore, businesses need to make greater efforts and improve competitiveness to enjoy the benefits provided by the EVFTA. According to the General Department of Vietnam Customs, export-import turnover between the two countries in 2014 totaled US$175.8 million, a year-on-year increase of nearly 18.83 percent. Vietnam’s export turnover stood at US$55.04 million through the main exports of garments and textiles, spare parts and vehicles. Meanwhile, import turnover reached US$120.8 million with the main imports being machinery and equipment and pharmaceutical products.